Help music majors and non-majors alike hear their way to understanding with a fully digital platform that integrates sounding history, theory, and performance in imaginative new ways. Students make sense of music’s stories by learning about their rich cultural contexts, often tied to everyday concepts (like baseball!). Explore all of Western music's major movements and composers, from the Middle Ages to Minimalism, from Hildegard of Bingen (born 1098) to John Adams (born 1947). Alongside Western art music, An Eventful Story features popular music and a growing collection of global musics, the latter through intimate video encounters with gifted performers. Clicking the “Play” icon starts the work under discussion, from right within Eventful Story, while choosing “Listening Guide” or “Score” launches deeper resources. Students jump seamlessly back and forth. Musical concepts and challenging English vocabulary link directly to the Deep Glossary. 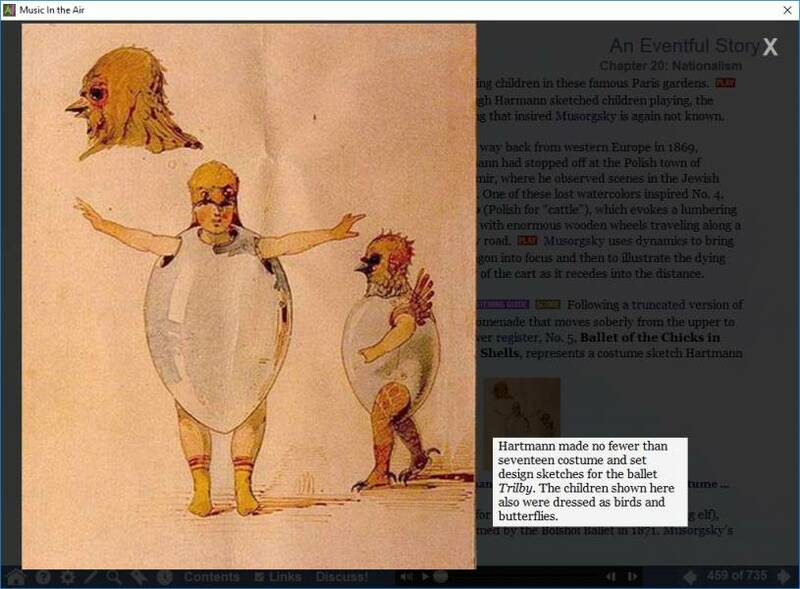 Clicking on in-text thumbnails brings up hundreds of full-screen images and full captions. Bouncing blocks take students of all levels through each section of every piece. To hear any location (“Closing area,” for example), students simply click on it, and voila. For all vocal works, the Listening Guides include both the original language and a smart-sense English translation. MITA includes an unrivaled set of 160 Listening Guides that offer detailed background information and full commentary. Most Guides include two toggle-able levels: Level 1, assuming no prior musical training, and Level 2, challenging more advanced learners to connect what they hear to musical ideas and language they already know. As the music plays continuously, MITA’s trademark bouncing blocks guide novices and experts alike through each bar of more than a hundred scores. Each score includes a detailed overview of what’s in it. Clicking on any location from the overview instantly brings up that location in the score and starts playing; shift+click starts anywhere in the music while staying on the overview. Clicking on any bar plays the music from exactly that point: great for examining details or even practicing sight-singing. Students can go through a score page by page, jump to a specific page number, or click on “Go To” to play from a specific moment in the piece (“Coda,” for example). Want students to just silently read or listen to a score on their own? They can turn off the commentary and bouncing blocks with a single click and have at it. Students don't just read definitions: they hear them! In-text “Play” buttons illustrate written concepts. Hundreds of textual “pop-ups” give them a play-by-play of exactly what they are hearing. An alphabetical index is supplemented by a “Musical Languages Guide” that builds knowledge step-by-step, from the most basic concepts (“music”) to the most advanced (“modified strophic form” or “disability studies”). Straightforward definitions for over 1500 challenging non-musical English words. Every word includes an audio pronunciation. Discovering music should be elegant, intuitive, and easy on the back. 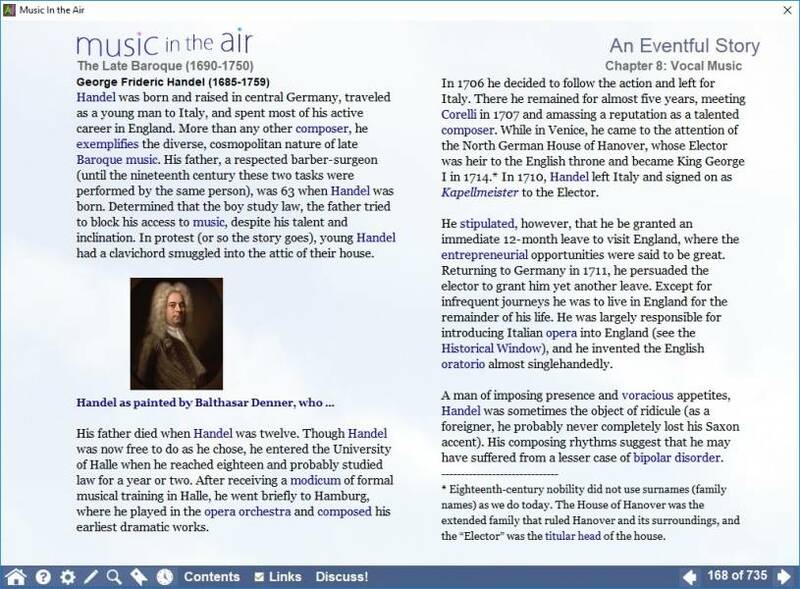 A powerful one-stop platform serves as textbook, music scores, sound recordings, and more. You and your students will never need to interrupt learning to find a page, a piece, or a track. MITA’s An Eventful Story traces the history of Western and selected world musics in an accessible and engaging manner. 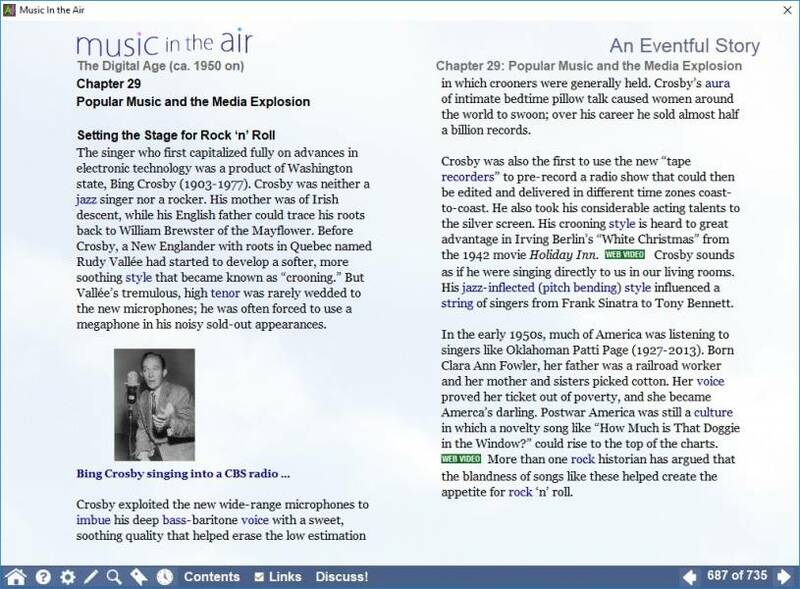 But it does much more: music jumps straight from the text, illustrating key points; thumbnail illustrations go full screen with detailed captions; more than 2,000 terms link directly to the Deep Glossary; and links to external reading provide ideas for supplementary assignments (or just feed curious students’ minds). An Eventful Story links seamlessly (both to and back from) MITA’s three other main sections. MITA’s repertoire is both representative and fresh—works that appeal to the ear while being eminently teachable. From Hildegard to Harbison, plainchant to Puccini, Monteverdi to Messaien and Madonna (including some delightful sidetrips), China to the Middle East, MITA covers the waterfront. At $9.95/mo., with discounts for longer-term subscriptions, MITA brings unparalleled resources at prices students can afford. MITA saves one-semester music appreciation students up to 82% compared to new versions of leading music appreciation textbooks. It saves up to 48% compared to rentals—and without the logistical hassle. Check out the full range of prices on our Subscriptions page. Instructor copies of MITA are provided free of charge when you adopt MITA for your course in the Adopt MITA tab. MITA delivers a multi-layered experience that only computers can offer. Finding the right level for your students is both easy and flexible. Lesson and assignment planning allows you to sort by date, periods, composers, styles, repertoire, genres, and regions. Assign listenings with either novice or advanced annotations. Oscillate freely between history, theory, and performance. MITA is at home in the music appreciation hall and the graduate seminar, the theory classroom and the course in orchestration. MITA’s 4,000 pages of breakthrough Interactive Scores bring notation to sounding life. As the music plays, novices and experts alike enjoy following along with the bouncing blocks that guide them through a work. Users can also jump instantly from section to section to demonstrate structural parallels. Optional annotations explore musical concepts in their detailed contexts. With a single click turn the annotations off to create your own reading. Essays (always headed by basic definitions suitable for beginners) accompanied by well-chosen musical examples and guided visual pop-ups breathe sound and clarity into hundreds of theoretical terms. Terms linked from within MITA’s Eventful Story and Listening Guides offer the rare opportunity to reinforce history with theory, performance with both. Additionally, the Deep Glossary’s concise definitions of challenging English words help ESL students quickly build vocabulary. Planning a lesson on all-things Brahms? Can’t remember where that reference to Miles Davis was? Use MITA’s powerful search engine to access instantly every mention of a term from a contextualized list. MITA teems with performances by world-class artists—from the Berlin Philharmonic to the Takacs Quartet, Dame Joan Sutherland to Sir Georg Solti—as well as video explorations of more than 100 Western and world instruments performed largely by students. Annotated links to more than 350 external videos provide access and illumination about even more performances of high quality. We believe that the story of an incredible body of work that is predominantly European would be incomplete without a discussion about the ugly truths of colonialism. While examining European conquests in which musicians sometimes found themselves caught in the middle or even direct perpetrators, MITA explores important contributions by members of historically marginalized groups such as women, indigenous peoples, and Africans and offers explanations for why knowledge about the great pasts of these groups is limited. 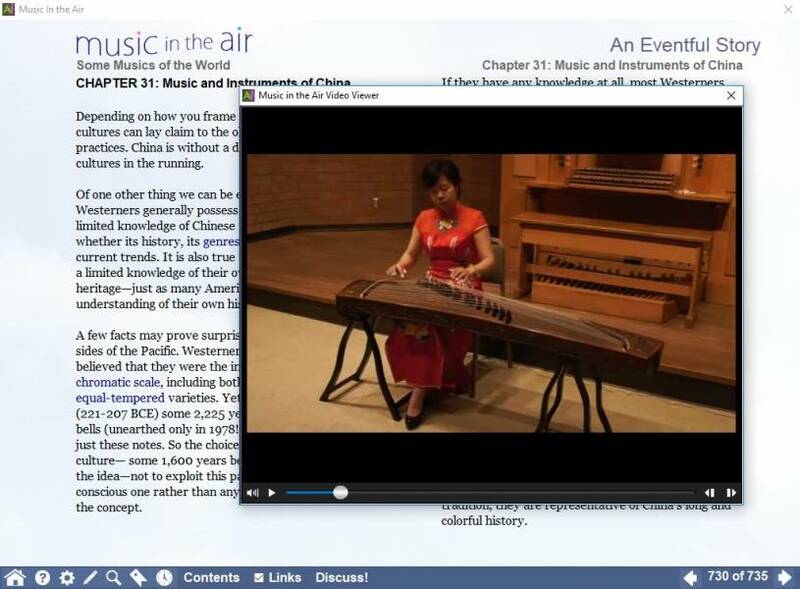 In Version 1.0 students have access to original custom videos of traditional music from China and the Middle East, as well as an engaging video introduction to world music studies by UCLA Professor Emeritus Anthony Seeger. Fresh cultures are in the pipeline. Traditional instruments from the Hawaiian ukulele to Scottish bagpipes highlight the manner in which Western music has borrowed freely from many cultures and traditions. Popular music is integrated from the Middle Ages to the present. MITA has been programmed and packaged with educators and students in mind. All audio and video is streamed from our reliable servers (you must be connected to the internet to use the program). With MITA’s high-resolution file compression, resources are easily delivered over your home or institution’s Wi-Fi network, or even using a smartphone hotspot. Guided by its mission to engender lasting curiosity about music, MITA remains an agile, perpetual work-in-progress. MITA’s development team will roll out new features and additional repertoire on a regular basis, as well as respond to user input. If we are in error, we’ll fix it quickly. We welcome your thoughts and suggestions. Drop us your comments on the contact page, and sign up for our emails to be the first to know when new features and repertoire are released. ArtsInteractive’s team of musicians and educators boasts more than one hundred years of combined experience in higher-ed and self-learner music education. Principal author Robert Winter is an award-winning UCLA teacher, scholar, and performer. Designer/programmer Peter Bogdanoff’s interactive work has inspired audiences from the Pacific Symphony to the New York Philharmonic. Senior Educational Liaison Robert Freeman is the former dean of the Eastman School of Music, the New England Conservatory, and the University of Texas at Austin. We are passionate pioneers in digital media who have earned praise from Wired, The Wall Street Journal, People Magazine, The New York Times, and Newsweek, and funding from the National Endowment for the Humanities. We use the term tables (plural) of contents because, unlike paper-bound textbooks, MITA offers eight different ways of sorting and approaching centuries of music. Below we have laid out the contents of MITA’s “An Eventful Story” by periods and chapters, which is the chronological approach taken by most music books with which students and instructors may be familiar. However, we encourage educators to consider all types of lenses! 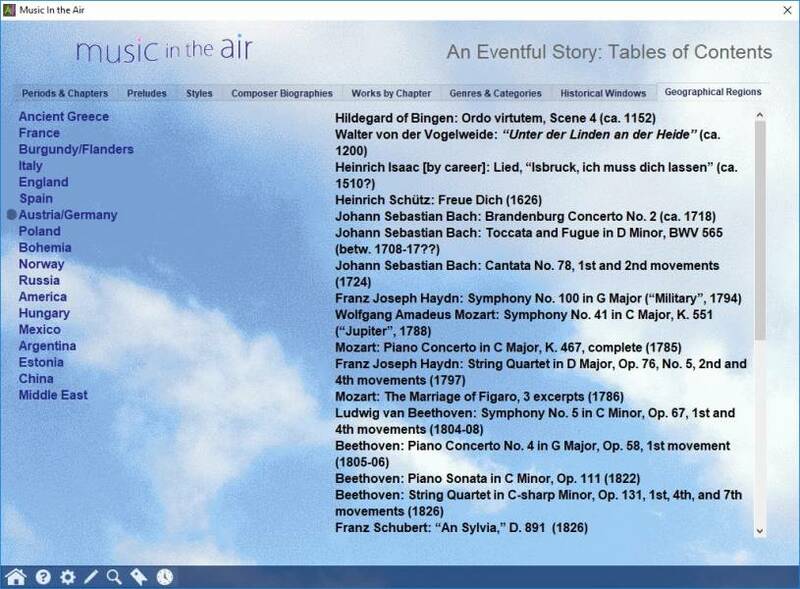 Other ways of sorting “An Eventful Story” include by preludes (the extra-musical historical overviews that give context to the music), styles (like Renaissance and Modernism but also sub-styles like the motet and twelve-tone), composer biographies (jump to the overview of any composer in MITA, listed alphabetically or chronologically), works (find the overview of a specific work), genres & categories (opera, orchestral, electronic, etc. 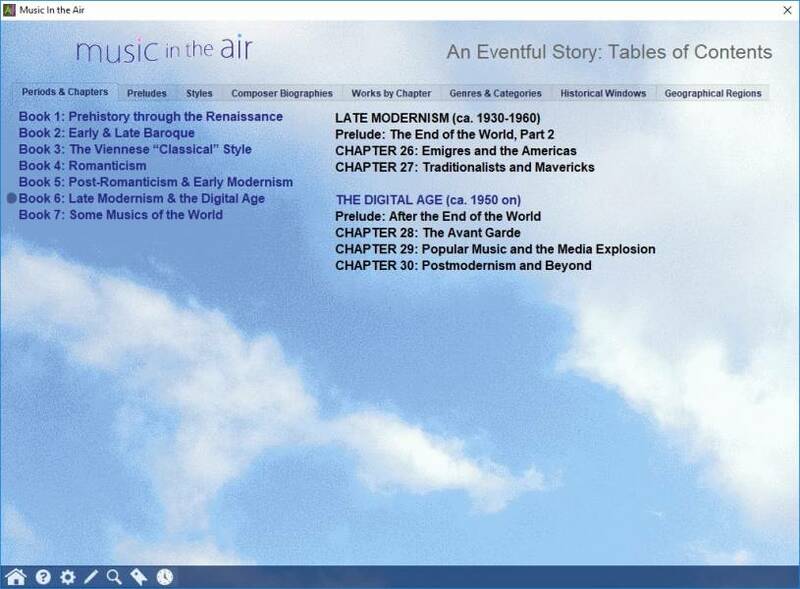 ), historical windows (special features from every era like “A Choirboy's Life at Notre Dame” and “The New Orleans Brass Band”), and geographical regions (works in MITA from Austria/Germany, the United States, the Middle East, etc.). What repertoire does MITA cover? Updated March 22, 2019. To see the most up-to-date repertoire, download the free MITA Sampler and check out the list in the “Works Etc. by Chapter” panel from An Eventful Story’s Tables of Contents. Works denoted in green are additions to MITA planned for the near future. Where do MITA’s recordings come from? MITA’s alliance with Universal Music Group (including Decca, London, Deutsche Gramophon, Archiv, and L’oiseaux lyre), along with contributions from labels such as Nonesuch, Teldec, and Chandos, makes our carefully chosen offerings of unrivaled quality. MITA’s content has been carefully designed to fit a wide range of music courses, from non-major music appreciation courses to music-major history surveys to graduate composition seminars, and any course in between. If there is material that doesn’t fit your course, MITA’s modular (vs. page-by-page serial) approach makes it easy to skip. This approach also means that the content you need is there if you know where to look. Start with An Eventful Story’s tables of contents (just select “An Eventful Story” from the home screen), which allow you to organize history eight different ways, such as by chronology, geographical region, or musical work. The Deep Glossary, in addition to its default alphabetical ordering, can be organized into a Musical Languages Guide (just select “Deep Glossary” from the home screen and choose “View the Guide” from the green box on the right), which presents musical terms in categories like harmony, color, and musical notation. 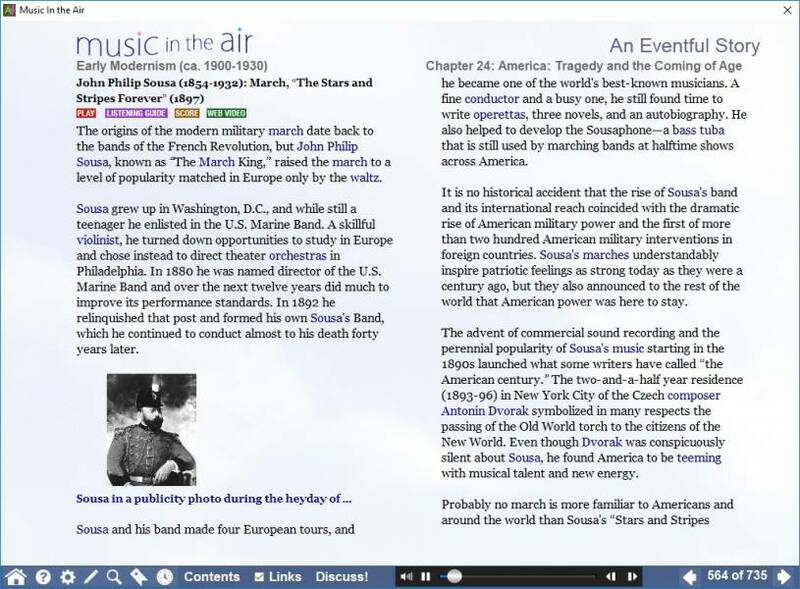 Make connections between the realms of history, theory, and performance by following MITA’s links and buttons to different sections; when studying Berlioz in An Eventful Story, for example, you might instruct students to follow the glossary link to “orchestration” and make that topic a focus of your lesson. Finally, use the search function (find the magnifying glass in the menu bar at the bottom of each page) to find all mentions of a term in MITA. How can MITA serve “students of all ages and levels” when textbooks target specific groups? Digital spaces render narrowcasting textbook constraints obsolete. MITA does not throw you into the deep end of the pool. Instead, its layered approach lets you put your feet on the first step of the shallow end and walk in at your own speed (later on you can jump into the deep end). How does this work? The narrative of “An Eventful Story” is aimed at motivated college freshmen in either non-major music appreciation courses or music-major history surveys (though MITA has been used successfully by middle- and high-school students as well). Compact definitions of not only musical terms but of more than a thousand regular vocabulary words are available with a single click. The more than 150 Listening Guides are geared to those who do not read music or have any special training. They invite the student to click and listen at their own speed. Many Listening Guides include a Level 2 that challenges more expert listeners to hear at a deeper level. The 110+ Interactive Scores are accessible to complete novices because MITA’s trademark bouncing blocks follow the music as it plays. Beginners learn to navigate scores the same way they picked up spoken language as toddlers. For experts or professionals, both the bold red comments and the “More” feature provide ample fodder for in-depth discussions. All entries in the Deep Glossary begin with a concise definition that instructors can specify, or they can delve more deeply at their discretion. The Deep Glossary contains entries on methodologies such as ethnomusicology, cultural theory, gender studies, feminist musicology, and disability studies. With its built-in flexibility, MITA can support (and/or supplement) beginner to advanced courses in music appreciation, music history, theory, orchestration, form and analysis, pedagogy, or courses that explore issues such as race and gender. The beginner will not feel overwhelmed; the expert will find plenty to chew on. Besides serious college courses, MITA has engaged (in its English version!) 125 six-to-nine-year-old Chinese piano students in a 2-hour public presentation without any loss of enthusiasm or concentration because they came to the stage one after the other and ran the program themselves. What kind of Wi-Fi does my institution require in order to run MITA for large classes? MITA’s minimum file sizes and audio/video compression mean that our program runs smoothly on modest Wi-Fi setups. It is more important that systems be steady and reliable in order not to disrupt service. Our testing has shown that many students can use the program simultaneously without degrading performance. If you plan to be using MITA in a classroom or auditorium and have any reservations about the Wi-Fi coverage, try out the program at your institution before adopting. How much does MITA cost? MITA is the most integrated, affordable music learning resource currently available, with Monthly, 6-Month, and Annual Subscription options to fit the individual needs of your students. See the latest pricing information on our Subscription page. Instructors and their teaching assistants in courses using MITA receive a complimentary subscription for the duration of the course. Instructors can supply names and email addresses of TAs when requesting their free subscription here. MITA has been used intensively since 2010 in both undergraduate and graduate classes at UCLA (and other southern California campuses), ranging from freshman General Education courses to graduate seminars. As the most diverse campus in the United States, UCLA has provided an ideal test bed, and dozens of student suggestions have been incorporated into MITA’s content and user interface. If you’re ready to adopt and have your students subscribe to MITA for an academic course you are teaching, complete the form below to receive a complimentary instructor copy for the duration of your course. Students can select a low-cost monthly, 6-month, or annual option on our Subscriptions page. Thanks for choosing MITA! Comments (Optional). If you would like to request additional licenses for teaching assistants, please indicate their full names and email addresses. Send me occasional updates about MITA. MITA makes a great addition to library workstations and downloadable resources available to patrons online. Contact us about special bulk rates available to public libraries and those affiliated with educational institutions.